captured by the police in Bayelsa State. Owei, an indigene of Ikebiri people group of Southern Ijaw however inhabitant in Ovom, Yenagoa, is said to be the suspected killer of James Onuh, an individual from National Youth Service Corps. The corner was killed in Obele area of Yenagoa, the state capital, in 2016. 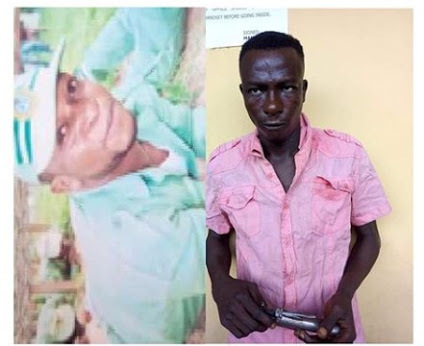 The suspect’s victim (Onuh), who was a graduate of the Federal University of Agriculture, Markurdi, Benue State, was then attached to the Bayelsa State Ministry of Works and Infrastructure for his primary assignment. Onuh was shot dead at Obele junction in Yenagoa while using the ATM in 2016. It was also gathered that the suspect was tracked and arrested by the special tactical team of the State Police Command following an order of the State Commissioner of Police, Austin Iwar. The Police Public Relations Officer, Bayelsa State Command, Asinim Butswat, confirmed the arrest of Owei. The police spokesman, a Deputy Superintendent of Police, said the suspect was arrested at the Samson Siasia Sports Complex, Yenagoa, on his way to watch a football match. He said the police recovered a locally-made revolver pistol, one live cartridge and packets of Rohypnol tablets from Owei.